As I begin writing this, the aromas of mloukhieh, cardamom, coriander, and garlic infuse the air, sending my stomach in mad rages. 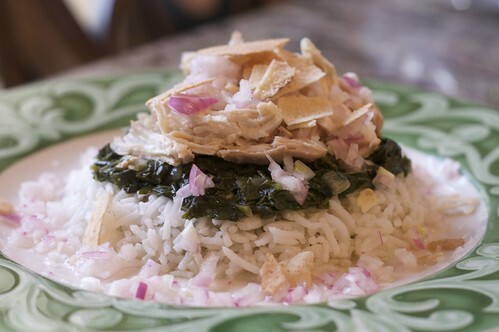 Mloukhieh, the Egyptian national dish, is extremely popular in Lebanon and is one of my favorite dishes. 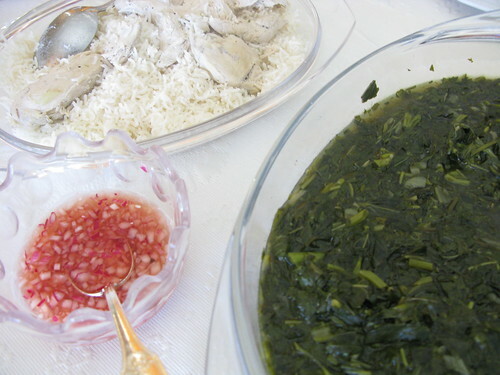 Mloukhieh leaves are a type of edible green similar to spinach and in the English language are called Jew’s mallow. This leafy green vegetable has a mucilaginous texture, similar to okra, when cooked. The plant is said to be rich in antioxidants. 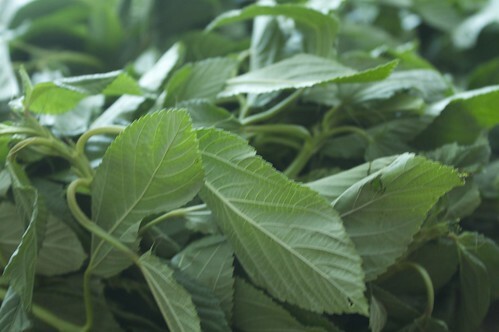 Mloukhieh leaves can be found at any Middle Eastern grocer and most likely in frozen form. Although, fresh leaves were used in the following recipe, using frozen is fine as well. 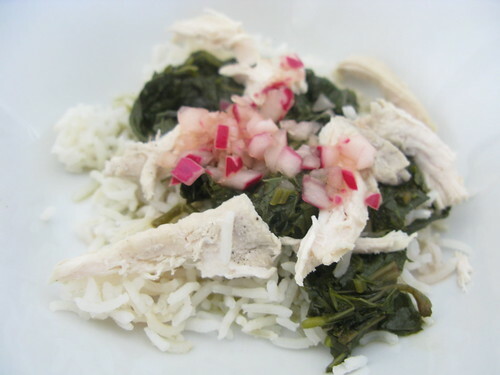 In Arabic, mloukhieh means “of the kings”, which refers to the dish as well as the Jew’s mallow leaves that are used. The sweet-scented cardamom, along with the allspice, lends heart-warming flavours to this regal dish. If you can‘t find fresh Jew’s mallow, frozen leaves work just as well, or you can use spinach instead. Put the chicken, cardamom pods and seeds, cinnamon stick, bay leaf, sweet onion, 1 of the garlic cloves, the nutmeg and 750ml/26fl oz/3 cups water in a deep, heavy-based pan. Season to taste with salt and pepper. Cover, heat over a medium heat and bring to the boil, then reduce the heat to low and leave to simmer for about 40 minutes until the chicken is cooked through and the broth is flavourful. Preheat the oven to 150 ?C/300 ?F/Gas 2. Remove the pan from the heat and strain the contents, reserving the broth. Separate the chicken from the spices and aromatics. Transfer the chicken to an ovenproof plate, then shred the meat from the bones or slice it off. Cover and keep warm in the oven. Heat the oil in a deep, heavy-based pan over a medium heat. Add the shallots and cook for 2–3 minutes or until soft and translucent. Meanwhile, pound the remaining cloves of garlic into a smooth paste using a pestle and mortar or process in a mini blender. Add the garlic paste to the pan and cook for 1–2 minutes until fragrant, then add the coriander and stir well. Pour in the reserved chicken broth, sprinkle in the allspice and stir. Add the chopped Jew’s mallow leaves and stir well, then reduce the heat to low and cover partially with a lid. Simmer for 10 minutes, checking that the mixture does not come to the boil, otherwise it can coagulate, rendering it inedible. Jew’s mallow has natural thickening agents, so don’t worry if it looks too runny initially, as it will thicken up. Mix the red onion and apple vinegar in as mall bowl and set aside. 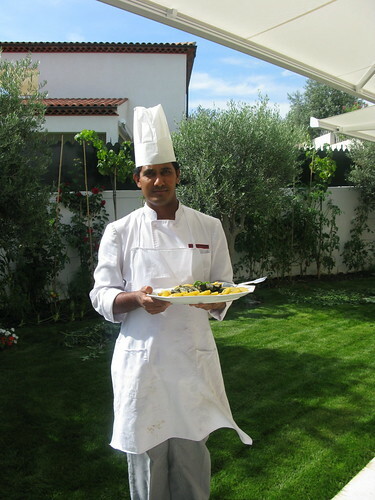 then assemble their own dish to their liking, first creating a bed of rice, followed by a layer of Jew’s mallow mixture with as much juice as they like, then chicken, a sprinkling of crumbled bread and finally a drizzle of the onion vinaigrette. I can almost smell the fragrance of this dish just by reading the ingredients – shallots, garlic, cardamom and cinnamon – that’s enough to send a clear message to my stomach too! love this one. is their a tab where we can download the recipe? I love mlokhieh taste :). This is a great blog post. thank you very much for the wonderful insight and we really appreciate the time you took to write this. thank again.